A member of the Ranchers.net's Ranch Talk Forum, graybull, made an interesting comment about my blog. I realize that this is a common misconception from the examples and explanations I have been using to describe genomic selection and genomic-enhanced EPDs. Let's see if I can fix that. First, these tools can be used to reach an optimum rather than an extreme. In fact, as you get closer to the optimum, you need to make small, precise steps, rather than large steps of varying precision. As you approach the apex of the peak, if you continue to take large steps, it is possible you could go past the optimum. But, decreasingly small, precise steps in the right direction will help you reach the optimum. 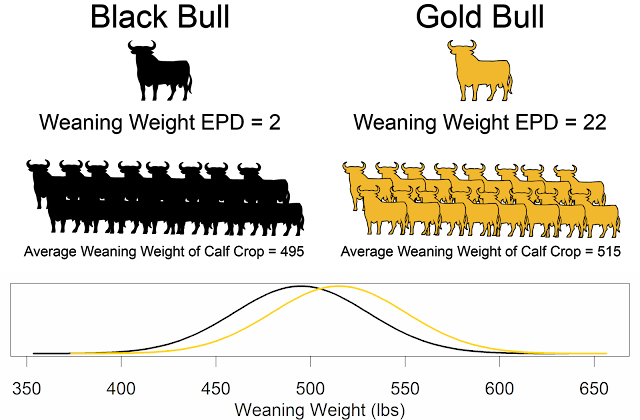 Genomic-enhanced EPDs provide more precise estimates of the animal's genetic worth earlier in the life of the animal, especially when compared to parent average EPDs. Genomic-enhanced EPDs provide the most bang for the buck when young animals are tested for which there is little data. By making breeding and culling decisions using more reliable genomic-enhanced EPDs, a breeder will be able to reach an optimum easier. Assume the grid below represents two traits, birth weight from left to right and milk from front to back. 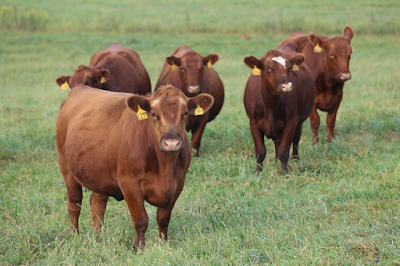 If birth weight is too small, calves are under-developed and struggle after birth. If birth weight is too large, we end up with calving problems. If milk is too low, the dam does not provide enough milk and the calf is light when we take it to market. If milk is too high, the dam does not have the energy resources to be fertile and rebred. For these two traits we are trying to reach the optimum in the middle. Genomic-enhanced EPDs can help us reach that peak, as we make better decisions when we cull heifers or buy a clean-up bull. Second, as a caveat, there is an idea floating around that if you are going to fail, fail fast. This is a data-driven philosophy where you try a new approach, gather lots of data, then quickly evaluate the outcome. If the new approach is working, continue to use it. If the new approach fails, cut your loses and move on. This idea is usually associated with tech start-ups, and I make no claims about how appropriate it is to livestock production. Please share your thoughts in the comments about reaching an optimum or failing fast. failing fast is indeed used in startups. however, one sometimes makes the mistake that the reward was at the edge of a cliff and then adjust one standard deviation back. intervals are important in failing fast, as is dividing things. everything has a heel.